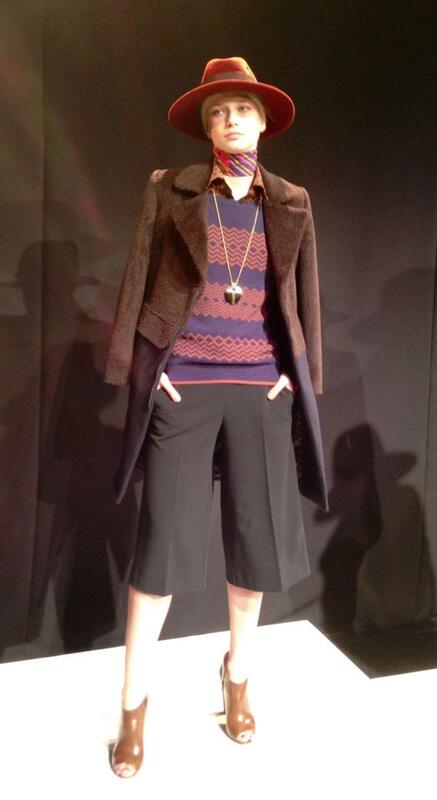 Trina Turk’s “California Modern” Fall 2013 show at New York Fashion Week is her take on the style of California today. Anyone who watched TV in the 70’s may think she was also channeling Mary Richards with a dash of Rhoda Morgenstern from the Mary Tyler Moore show. The collection, shown on posed models, was beautifully styled by Kate Mossman, and included head to toe dressing, something I have not seen in years, and it looked great! The first model in a Plum crepe jumpsuit with requisite matching skinny belt, elbow length gloves, scarf, and fedora, was stunning. Wide leg high waist trousers ran throughout the collection looking modern, chic and divinely wearable. 70’s heaven. Everyone stopped for the “Lake”, (Hunter Green) trouser and quilted lamb bomber jacket and blouse with “Midnight”, (Navy) accent, topped with a matching colored fedora, a signature throughout the collection. Chevron prints in beautiful column dresses of satin and jersey were pure California. Merlot anyone? A discussion of this show would not be complete without the mention of “Gauchos”, and no, you did not read that wrong! A Black Gabardine Gaucho topped by a zigzag sweater and Alpaca and Melton coat looked surprisingly fresh. Alpaca and Curly Lamb coats and vests came in a variety of colors-lake chocolate, wine, and black. These were the edgiest items in a solid collection with tons of sellable pieces. 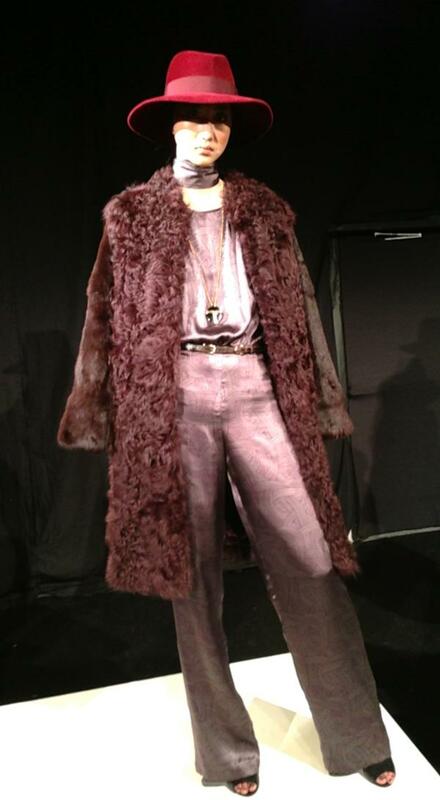 Trina Turk’s Fall 2013 Collection was beautiful and made homage to the 70’s in a totally unexpected manner. simply loving the hats and the color ! !